Peoria Assn. Of Pastors For Community & Spiritual Renewal: Are Homosexuals A Protected Class In Peoria? Are Homosexuals A Protected Class In Peoria? "You can't give notice to the effect that certain protected groups are not welcome." According to the Chicago Tribune in an article "Peoria Gays React To Unwelcome Sign" City Council Woman Barbra VanAuken (Left) singlehandedly and unashamedly conferred "protected class status" on gays living in Peoria. This particular class status has normally been reserved for individuals who have struggled or struggle to gain civil rights based on color or ethnic heritage. The disabled, and those discriminated against in housing and employment have also been afforded "civil right" status and in some cases have been made a "protected class". What's more it seems that not only has Mrs. VanAuken expanded the definition of "protected class" to include gays, but also to include public displays of gay affection as acts being "protected" under the law. 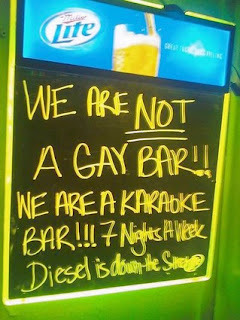 It all started when the Elbow Room Bar located downtown Peoria, owned by Mr. Greg Quast placed this sign in the window of his establishment because he had noticed an increase in gay couples, many involved in open displays of affection either in or around his facility. As should be his legal right, he let the public know his establishment's position on certain activities and gave individuals an option to go to another location to fulfill their public passionate displays. This led a newly formed gay activist group, One World One Equality, to stage 3 protests in an effort to draw attention to their cause and shame the owner of the bar as a "homophobic". Obviously the tactic worked on Barbra Van Auken, as she levied "protected class" citizenship status on Peoria gays and also unwittingly endorsed public displays of "gay affection". As an African American minister, I must admit I was stunned to read where Council member Barbara Van Auken stated in an article out today in the Chicago Tribune that homosexuals are a protected group. This is in response to a bar owner's clarification of the nature of his bar. Additionally, the article noted that the Peoria city council said state law prohibited such actions. Specifically, what state law says that the owner of a business cannot prohibit certain individuals from coming into his or her establishment and exhibiting behavior unwelcome or not an indigenous aspect of such an establishment? Could this same law be used against churches who prohibit homosexuals from showing open "affection" in the on church property?As an elected official, did Van Auken really mean to say that homosexuals are a "protect group" as if they are some sort of endangered species? Please tell me if are there any groups of people, in your opinion, which would not be a protected group? I don't understand, what's the criteria for assigned "protected" status to one group and denying it to another? I hope that you will take some time and clarify these remarks. We stand with the inquiry and sentiments of Pastor Foster. Unless Peoria has enacted a special law under their home rule authority, this was and is the wrong move and certainly the wrong message for Mrs. Van Auken to make. To our current knowledge, Peoria gays are not "protected class" citizens and acts of overt public displays of sexual passion, whether homosexual of heterosexual, are restricted. Further, homosexual rights of sexual freedom are NOT civil rights, neither are they equated to to the struggle for racial or moral equality. This is all very interesting for an additional reason. In 2007 the Downtown Peoria bars were unaccepting of Black citizens supposedly because of their dress and demeanor which was considered to be "intimidating". Instead of making downtown bars comply in the acceptance of Black patrons, the City Council, under the leadership of Mayor Ardis, undertook the notion of liquor expansion to have alternate places for "Blacks to go". This was done against the sincere pleading of the Pastor's Association, The Citizens For Community Values, The Peoria South Side Mission and many neighborhood associations and other grass roots organizations. In other words, the rights of Blacks are not protected, were minimized and only compartmentalized by this city and it's council, whereas the rights of gays have been expressed to have somehow been protected. This issue needs and deserves immediate attention by this council. It seems that the Peoria City Council should at least use this opportunity to either educate the public as to what the law states about "protected class" citizens in Peoria or become better educated themselves on the arising gay agenda and the difference between civil rights and gay rights. This is especially poignant since the State of Illinois is considering instituting civil unions as the law of the land, and citizens need to know where we currently stand. If homosexual rights is the law of Peoria, we defer to such guidance as received from the council on the matter. If it is not, we advise that Councilwoman Barbara Van Auken issue a public statement of apology to both the bar owner Mr. Quast and the citizens of Peoria for misrepresenting the laws under which Peoria and the State Of Illinois operate.